February 19 marks the anniversary of the Battle of Iwo Jima, Japan, in World War 2 (in 1945). This is an important part of American World War 2 history, which many upper grade students learn about. Here’ s a page I put together to teach my students about this landmark battle. It provides basic information (text from ducksters.com) and asks students to write a 5-6 sentence summary using the information. The famous picture of the US Flag being raised on Iwo Jima was actually not the first flag raised by the US. Another smaller flag pole had been put there earlier. Although the US had more soldiers wounded on Iwo Jima than the Japanese, the Japanese had many more deaths. This was because the Japanese had decided to fight to the death. Out of 18,000 Japanese soldiers only 216 were taken prisoner. The rest died in the battle. Around 6,800 American soldiers died in the battle. The US government awarded 27 soldiers with the Medal of Honor for their bravery during the battle. There were six men in the famous picture showing the US flag being raised. Three were killed later in the battle. The other three became famous celebrities in the US. The Japanese dug 11 miles of tunnels within the island of Iwo Jima. A huge thank you to all the servicemen/women and their families who have and continue to fight for American freedom! 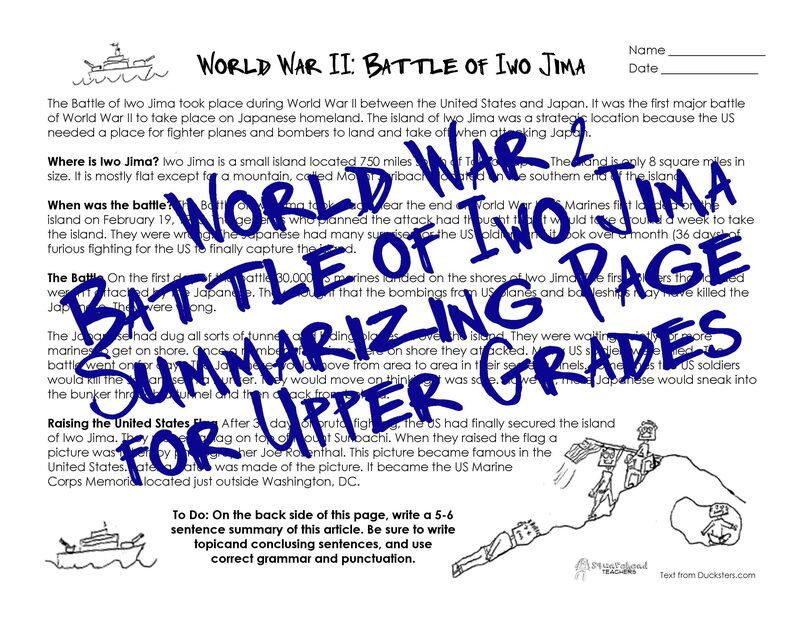 This entry was posted in American Hist./Patriotic, Holidays/Seasons, Language Arts, Reading, Social Studies and tagged American history, Children, Education, Elementary School, Iwo Jima, Kids, Social Studies, Teacher Resources, Teachers, Teaching, upper grades, world history, World War 2 by Squarehead Teachers. Bookmark the permalink.